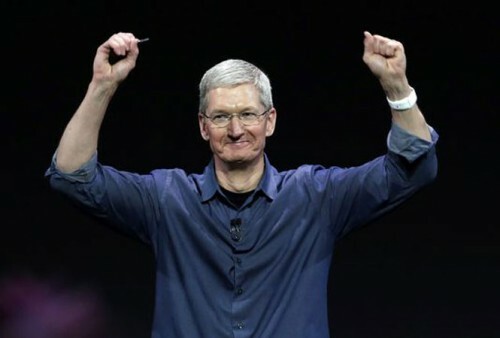 Apple became a trillion-dollar company this week and CEO Tim Cook’s expanding heart seems to have grown in response. Cook, 57, stopped by the LoveLoud Festival in Utah and said a few words onstage urging LGBTQ youth to “find, speak and live” their truth. Cook’s message was delivered to the crowd of 30,000. He later posed backstage with inspiration band Imagine Dragons. Apple nearly went bankrupt in the 1990s, but as of this moment – it’s inspiring the world with its numerous product releases, forced upgrades, low-battery warnings, and portrait mode camera lenses. Right, and Cook. He’s giving us all the feels. In a memo sent Thursday to Apple employees, Cook put the landmark measurement into perspective. “Steve [Jobs] founded Apple on the belief that the power of human creativity can solve even the biggest challenges – and that the people who are crazy enough to think they can change the world are the ones who do,” he added.